Upgrade the boring stock interior of your 05-09 Automatic Mustang with a bright chrome Shifter Bezel. Bright Chrome - Matches Factory Chrome Finish. Fits 2005 to 2009 Automatic Mustangs. Modern Styling. 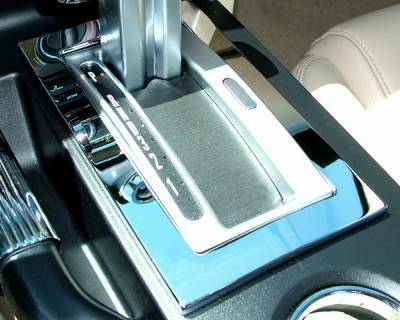 Cover up that ugly stock plastic shifter surround with a bright chrome shifter bezel that matches the existing satin and chrome accents of your 2005-2009 Mustang to help complete the unfinished look of your stock interior. Superior Quality. The Chrome Automatic Mustang Shifter Bezel is crafted from high quality 6061 T6 billet aluminum that is then triple chrome plated and polished to a brilliant shine. Easy Install. Simply peel the two sided 3M tape from the back of the bezel and set in place for an easy 5 minute install. Go from boring to WOW in seconds.